Antoñanzas Lorente Isidoro- Spagna 1806-1845 Sac. Marano Michelangelo- Italia 1827-1871 Sac. Marano Michelarcangelo- Italia 1805-1872 Sac. Naffsgier Louis- Francia 1812-1872 Frat. Sorre Marie-Joseph- Francia 1856-1899 Sac. Oudeville Auguste- Francia 1835-1900 Sac. Löbe Augustin-Friedrich Borussia 1834-1902 Frat. Bettinger Wilhelm- Borussia 1855-1909 Sac. Vassanelli Cristoforo- Italia 1863-1909 Frat. Payen Henri- Francia 1851-1918 Sac. Zbránek Josephus- Moravia 1887-1919 Sac. van Tooren Gerardus (Gerard)- Paesi Bassi 1853-1931 Sac. Giroux Auguste- Canada 1880-1933 Sac. Adamo Giovanni- Italia 1881-1935 Sac. Weisser Augustine- USA 1852-1935 Sac. Heslan Thomas-Xavier USA 1851-1936 Frat. Tordeur Jean-Baptiste-Félix Belgio 1856-1936 Frat. Scherner Hans- Germania 1919-1940 Stud. van den Broek Joannes-Justus Paesi Bassi 1894-1948 Frat. 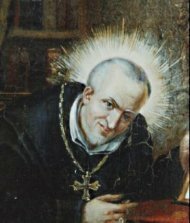 Hartley John-Alphonsus Regno Unito 1885-1949 Frat. Piller Pietro- Italia 1867-1956 Sac. Aubry André- Francia 1919-1960 Sac. Domínguez Yáñez Julio- Spagna 1880-1970 Sac. Nourdin Albert- Francia 1908-1971 Sac. O’Shea Jeremiah- Irlanda 1898-1978 Sac. Renehan John Francis- USA 1903-1978 Sac. Gomes John Raymond Portogallo 1897-1979 Frat. Beauregard Isidore-Isidore Canada 1894-1982 Frat. García González Pedro- Spagna 1904-1983 Frat. Verkoelen Matthias-Rodulphus Paesi Bassi 1905-1985 Frat. James William Patrick- Canada 1918-1986 Sac. Loncke Jan- Belgio 1933-1989 Sac. de Campos Vilela Gabriel- Brasile 1915-1992 Sac. de Araújo Pitiá Edelzino- Brasile 1926-1993 Sac. 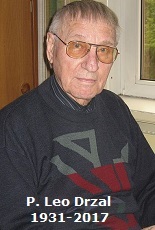 Veltman Tjipke (Timóteo)- Paesi Bassi 1918-1999 Sac. Lê Huy Bảng Christophe- Vietnam 1918-2002 Sac. Braat Henricus-Paschalis Paesi Bassi 1921-2010 Frat. 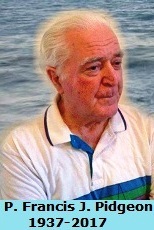 Kelly Patrick Joseph-Malachy Regno Unito 1925-2011 Frat. Nugent James Joseph- USA 1924-2012 Sac. Ross Georgius-Wiro Paesi Bassi 1927-2013 Frat. 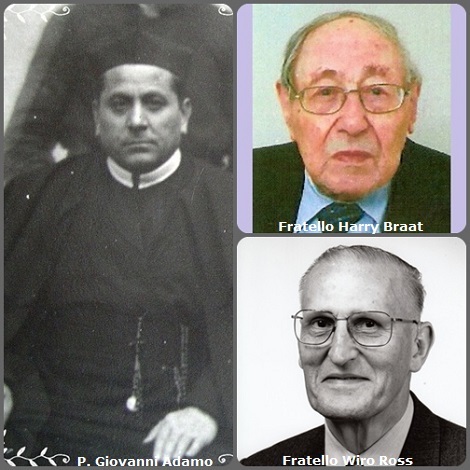 Tra i 42 defunti di oggi 9 aprile, di cui 5 italiani l’immagine mostra tre Redentoristi: l’italiano P. Giovanni Adamo (1881-1935) e due olandesi: fratello Henricus-Paschalis (Harry) Braat (1921-2010) e fratello Georgius-Wiro Ross (1927-2013). Drzal Leo Danimarca 1931-2017 Sac. Pidgeon Francis James Australia 1937-2017 Sac. 1. 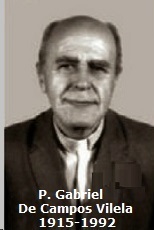 Il brasiliano P. Gabriel De Campos Vilela, 1915-1992. 2. 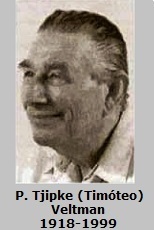 L’olandese P. Tjipke (Timóteo) Veltman, 1918-1999. 4. L’australiano P. Francis James Pidgeon, 1937-2017.